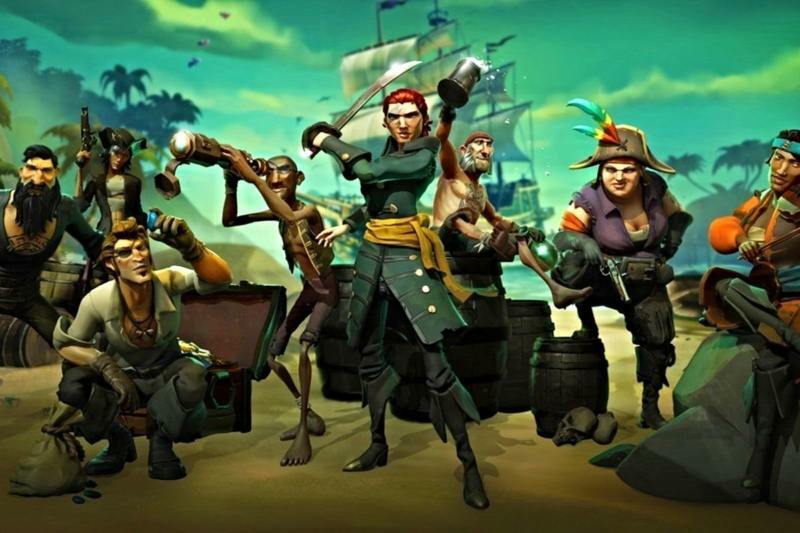 Пока все кто купил себе пиратскую игру Sea of Thieves допивают сотую бутылку рома, разработчики игры выпустили патч, который, по их словам, исправляет некоторые ошибки и улучшает производительность на всех платформах. Особенно это касается 4к на консоли Xbox One X.
Весит он, кстати, целых 20 ГБ. Как рассказала студия Rare в своих дневниках разработки, они бы могли сделать меньше патч, но понадобилось бы определенное время на его оптимизацию. В патче также были исправлены игровые награды. Они давались не сразу после того, как игрок их получил, а с небольшой задержкой. Некоторые игроки Sea of Thieves вообще не получили свои награды, а также дополнительное золото. I simply want to tell you that I’m new to blogs and honestly savored this blog. Very likely I’m likely to bookmark your blog post . You amazingly have superb stories. With thanks for revealing your web site. Wow, fantastic weblog structure! How long have you ever been blogging for? you made blogging glance easy. The entire glance of your website is wonderful, as well as the content! I just want to mention I am just new to blogging and site-building and seriously loved you’re web blog. More than likely I’m planning to bookmark your blog post . You certainly have terrific articles and reviews. Thank you for sharing with us your blog. Hey there. I found your web site by way of Google while looking for a related subject, your web site got here up. It appears great. I’ve bookmarked it in my google bookmarks to come back then. Hey there. I found your web site by way of Google whilst searching for a similar subject, your site came up. It appears good. I’ve bookmarked it in my google bookmarks to visit then. Hiya, I am really glad I have found this info. Today bloggers publish just about gossip and net stuff and this is actually irritating. A good web site with interesting content, that’s what I need. Thank you for making this web-site, and I will be visiting again. Do you do newsletters by email? Hello there. I found your blog by the use of Google while looking for a related subject, your web site came up. It seems great. I’ve bookmarked it in my google bookmarks to visit then. Hi there. I found your site via Google even as looking for a comparable topic, your site came up. It seems to be good. I have bookmarked it in my google bookmarks to visit then. Hello there. I discovered your site by the use of Google at the same time as looking for a comparable subject, your site got here up. It looks great. I’ve bookmarked it in my google bookmarks to visit then. Hey there. I discovered your website by the use of Google even as looking for a similar matter, your website came up. It looks great. I have bookmarked it in my google bookmarks to come back then. Hiya, I am really glad I’ve found this info. Today bloggers publish only about gossip and net stuff and this is really irritating. A good web site with interesting content, that is what I need. Thanks for making this site, and I’ll be visiting again. Do you do newsletters by email? Hi there. I discovered your website by means of Google at the same time as looking for a comparable matter, your website came up. It appears good. I’ve bookmarked it in my google bookmarks to come back then. Hiya, I’m really glad I’ve found this information. Nowadays bloggers publish just about gossip and web stuff and this is actually irritating. A good website with interesting content, this is what I need. Thank you for making this site, and I’ll be visiting again. Do you do newsletters by email? Hello there. I discovered your web site by the use of Google while looking for a comparable topic, your web site came up. It appears good. I have bookmarked it in my google bookmarks to visit then. Hiya, I am really glad I’ve found this information. Today bloggers publish only about gossip and internet stuff and this is really frustrating. A good website with exciting content, that is what I need. Thanks for making this web site, and I’ll be visiting again. Do you do newsletters by email? Hello there. I found your website via Google whilst looking for a similar matter, your site came up. It appears to be great. I’ve bookmarked it in my google bookmarks to come back then. Hello there. I found your web site via Google whilst looking for a related matter, your website got here up. It looks good. I’ve bookmarked it in my google bookmarks to come back then. Hi there. I found your website by way of Google even as looking for a related matter, your site got here up. It seems to be good. I have bookmarked it in my google bookmarks to visit then. Hello there. I found your site by means of Google whilst searching for a similar topic, your website got here up. It appears to be good. I’ve bookmarked it in my google bookmarks to visit then. Hey there. I found your website by the use of Google at the same time as searching for a related topic, your site got here up. It looks great. I have bookmarked it in my google bookmarks to visit then. Hello there. I discovered your site via Google even as looking for a similar subject, your web site came up. It seems to be good. I’ve bookmarked it in my google bookmarks to visit then. Hi there. I found your blog via Google even as looking for a similar matter, your web site came up. It looks great. I’ve bookmarked it in my google bookmarks to come back then. Hello there. I found your website via Google even as looking for a related topic, your site got here up. It appears good. I’ve bookmarked it in my google bookmarks to visit then. Hiya, I’m really glad I have found this info. Today bloggers publish only about gossip and net stuff and this is really annoying. A good website with exciting content, this is what I need. Thank you for making this site, and I will be visiting again. Do you do newsletters by email? Hey there. I discovered your website by the use of Google even as looking for a similar matter, your website got here up. It seems great. I have bookmarked it in my google bookmarks to visit then. Hello there. I discovered your blog by the use of Google while searching for a comparable topic, your web site got here up. It looks good. I have bookmarked it in my google bookmarks to come back then. Hiya, I am really glad I’ve found this info. Nowadays bloggers publish just about gossip and internet stuff and this is actually irritating. A good site with interesting content, that’s what I need. Thank you for making this web-site, and I will be visiting again. Do you do newsletters by email? Hiya, I am really glad I’ve found this information. Nowadays bloggers publish only about gossip and internet stuff and this is really annoying. A good blog with interesting content, that is what I need. Thank you for making this site, and I’ll be visiting again. Do you do newsletters by email? Hi there. I found your blog by way of Google whilst looking for a related matter, your site came up. It appears good. I’ve bookmarked it in my google bookmarks to visit then. Hiya, I am really glad I have found this info. Nowadays bloggers publish just about gossip and web stuff and this is really annoying. A good site with exciting content, that is what I need. Thanks for making this web site, and I will be visiting again. Do you do newsletters by email? Hiya, I’m really glad I have found this information. Today bloggers publish just about gossip and net stuff and this is really frustrating. A good blog with exciting content, this is what I need. Thanks for making this web-site, and I will be visiting again. Do you do newsletters by email? Hey there. I discovered your blog via Google even as looking for a comparable subject, your site came up. It appears to be good. I’ve bookmarked it in my google bookmarks to visit then. Hiya, I’m really glad I have found this information. Nowadays bloggers publish just about gossip and net stuff and this is actually frustrating. A good web site with exciting content, this is what I need. Thanks for making this web-site, and I will be visiting again. Do you do newsletters by email? Hiya, I’m really glad I have found this information. Nowadays bloggers publish just about gossip and net stuff and this is really irritating. A good site with interesting content, that’s what I need. Thank you for making this web site, and I will be visiting again. Do you do newsletters by email? Hiya, I’m really glad I have found this info. Today bloggers publish just about gossip and web stuff and this is really frustrating. A good blog with exciting content, that is what I need. Thank you for making this web-site, and I will be visiting again. Do you do newsletters by email? Hey there. I found your web site via Google whilst searching for a similar topic, your site came up. It seems to be good. I’ve bookmarked it in my google bookmarks to visit then. Hi there. I discovered your web site by the use of Google whilst searching for a comparable matter, your website got here up. It appears good. I’ve bookmarked it in my google bookmarks to visit then. Hello there. I found your blog by the use of Google even as searching for a similar topic, your web site came up. It appears to be good. I have bookmarked it in my google bookmarks to visit then. Hiya, I’m really glad I’ve found this information. Today bloggers publish only about gossip and web stuff and this is really annoying. A good website with interesting content, that’s what I need. Thank you for making this site, and I will be visiting again. Do you do newsletters by email? Hiya very cool website!! Guy .. Beautiful .. Amazing .. I’ll bookmark your web site and take the feeds also¡KI am happy to search out so many useful information here in the put up, we’d like develop more techniques on this regard, thanks for sharing. . . . . .
Hiya, I am really glad I have found this info. Nowadays bloggers publish just about gossip and web stuff and this is really irritating. A good web site with interesting content, that’s what I need. Thank you for making this site, and I will be visiting again. Do you do newsletters by email? Hiya, I’m really glad I’ve found this information. Nowadays bloggers publish just about gossip and net stuff and this is actually annoying. A good site with interesting content, that’s what I need. Thank you for making this website, and I will be visiting again. Do you do newsletters by email? Hey there. I found your website by way of Google whilst looking for a similar subject, your web site came up. It looks good. I have bookmarked it in my google bookmarks to visit then. Hey there. I discovered your web site via Google whilst searching for a similar topic, your web site got here up. It seems to be good. I have bookmarked it in my google bookmarks to come back then. Hey there. I found your website by means of Google even as searching for a comparable topic, your site came up. It seems good. I have bookmarked it in my google bookmarks to come back then. Hello there. I discovered your site by way of Google even as looking for a related matter, your web site got here up. It seems good. I’ve bookmarked it in my google bookmarks to come back then. Hey there. I found your site via Google at the same time as looking for a related matter, your website came up. It appears good. I’ve bookmarked it in my google bookmarks to visit then. Hey there. I found your site via Google even as searching for a similar subject, your site came up. It looks great. I have bookmarked it in my google bookmarks to come back then. Hiya, I am really glad I have found this info. Nowadays bloggers publish only about gossip and net stuff and this is actually annoying. A good web site with interesting content, that’s what I need. Thanks for making this website, and I’ll be visiting again. Do you do newsletters by email? Hey there. I discovered your blog by the use of Google at the same time as searching for a related subject, your web site got here up. It appears to be good. I have bookmarked it in my google bookmarks to visit then. Hey there. I found your web site by way of Google at the same time as searching for a related matter, your site came up. It appears great. I’ve bookmarked it in my google bookmarks to come back then. Hello there. I discovered your site via Google even as looking for a comparable topic, your site got here up. It appears to be good. I’ve bookmarked it in my google bookmarks to visit then. Hiya, I am really glad I’ve found this info. Nowadays bloggers publish just about gossip and net stuff and this is actually frustrating. A good site with exciting content, this is what I need. Thanks for making this website, and I’ll be visiting again. Do you do newsletters by email? Hi there. I discovered your site by the use of Google whilst looking for a similar matter, your site got here up. It appears great. I have bookmarked it in my google bookmarks to come back then. Hey there. I discovered your website by the use of Google while looking for a similar subject, your website got here up. It appears to be great. I’ve bookmarked it in my google bookmarks to come back then. Hey there. I found your website by the use of Google even as searching for a comparable topic, your site came up. It appears to be great. I have bookmarked it in my google bookmarks to visit then. Hiya, I’m really glad I’ve found this info. Today bloggers publish just about gossip and net stuff and this is really annoying. A good site with interesting content, this is what I need. Thanks for making this site, and I will be visiting again. Do you do newsletters by email? Hiya, I am really glad I have found this info. Nowadays bloggers publish only about gossip and net stuff and this is actually frustrating. A good web site with exciting content, that is what I need. Thanks for making this website, and I’ll be visiting again. Do you do newsletters by email? Hello there. I discovered your web site by way of Google whilst looking for a related topic, your web site got here up. It looks great. I’ve bookmarked it in my google bookmarks to visit then. Hello there. I discovered your blog by means of Google at the same time as searching for a related matter, your web site came up. It seems great. I’ve bookmarked it in my google bookmarks to visit then. Hey there. I found your blog via Google even as searching for a comparable subject, your website came up. It looks great. I’ve bookmarked it in my google bookmarks to visit then. Hello there. I found your website by means of Google while searching for a comparable subject, your site came up. It appears good. I’ve bookmarked it in my google bookmarks to come back then. Hiya, I am really glad I have found this info. Today bloggers publish only about gossip and net stuff and this is really frustrating. A good site with exciting content, that is what I need. Thank you for making this web site, and I will be visiting again. Do you do newsletters by email? I simply want to mention I’m all new to blogging and site-building and truly loved this blog site. Very likely I’m likely to bookmark your site . You certainly come with tremendous articles and reviews. Thanks a lot for sharing with us your website. Hiya, I am really glad I’ve found this info. Nowadays bloggers publish only about gossip and web stuff and this is actually irritating. A good blog with interesting content, that is what I need. Thank you for making this website, and I will be visiting again. Do you do newsletters by email? Hi there. I discovered your web site by way of Google while looking for a similar topic, your site came up. It looks great. I’ve bookmarked it in my google bookmarks to come back then. Hiya, I am really glad I’ve found this information. Today bloggers publish just about gossip and web stuff and this is really frustrating. A good website with interesting content, that’s what I need. Thanks for making this site, and I’ll be visiting again. Do you do newsletters by email? Hey there. I found your blog by way of Google even as looking for a related subject, your website came up. It appears to be great. I’ve bookmarked it in my google bookmarks to visit then. Hello there. I discovered your blog by way of Google while looking for a comparable subject, your web site got here up. It looks good. I’ve bookmarked it in my google bookmarks to visit then. Hiya, I am really glad I have found this info. Nowadays bloggers publish just about gossip and web stuff and this is really annoying. A good website with exciting content, this is what I need. Thank you for making this web site, and I will be visiting again. Do you do newsletters by email? Hiya, I’m really glad I’ve found this information. Today bloggers publish just about gossip and web stuff and this is actually frustrating. A good blog with interesting content, this is what I need. Thanks for making this site, and I will be visiting again. Do you do newsletters by email? Hey there. I found your web site by way of Google even as searching for a comparable topic, your web site came up. It seems to be good. I have bookmarked it in my google bookmarks to visit then. Hiya, I am really glad I have found this information. Nowadays bloggers publish only about gossip and net stuff and this is actually irritating. A good web site with exciting content, this is what I need. Thanks for making this site, and I’ll be visiting again. Do you do newsletters by email? Hello there. I found your website by means of Google while looking for a related topic, your web site came up. It looks good. I’ve bookmarked it in my google bookmarks to come back then. Hiya, I am really glad I have found this info. Nowadays bloggers publish only about gossip and internet stuff and this is actually frustrating. A good web site with interesting content, this is what I need. Thanks for making this site, and I’ll be visiting again. Do you do newsletters by email? What i do not understood is in fact how you are not actually a lot more well-favored than you might be right now. You are very intelligent. You recognize therefore considerably relating to this topic, produced me personally believe it from a lot of numerous angles. Its like women and men don’t seem to be interested until it¡¦s something to accomplish with Woman gaga! Your individual stuffs excellent. Always handle it up! Hey there. I found your website by the use of Google while searching for a comparable matter, your site got here up. It appears to be great. I’ve bookmarked it in my google bookmarks to come back then. Whats Happening i am new to this, I stumbled upon this I’ve found It absolutely helpful and it has aided me out loads. I hope to contribute & aid other customers like its helped me. Good job. Hi there. I discovered your blog by way of Google while looking for a similar matter, your web site got here up. It appears to be great. I’ve bookmarked it in my google bookmarks to visit then. Hey there. I found your web site by means of Google at the same time as searching for a similar matter, your website got here up. It seems to be great. I’ve bookmarked it in my google bookmarks to come back then. Hi there. I discovered your site by way of Google while looking for a similar matter, your web site came up. It seems to be good. I have bookmarked it in my google bookmarks to visit then. Hiya, I am really glad I have found this info. Nowadays bloggers publish just about gossip and web stuff and this is really frustrating. A good website with exciting content, that is what I need. Thanks for making this site, and I’ll be visiting again. Do you do newsletters by email? Hey there. I found your website by means of Google at the same time as looking for a similar topic, your web site got here up. It seems to be great. I have bookmarked it in my google bookmarks to come back then. Hello there. I discovered your web site by way of Google whilst searching for a similar topic, your site got here up. It appears to be good. I have bookmarked it in my google bookmarks to come back then. Hey there. I discovered your website by way of Google whilst looking for a comparable matter, your web site came up. It appears great. I’ve bookmarked it in my google bookmarks to come back then. Hey there. I found your blog by the use of Google while searching for a similar matter, your website got here up. It appears to be great. I have bookmarked it in my google bookmarks to come back then. Hi there. I discovered your web site by way of Google while searching for a related matter, your website came up. It seems to be good. I’ve bookmarked it in my google bookmarks to visit then. Hi there. I discovered your website by means of Google even as looking for a comparable matter, your site came up. It appears great. I have bookmarked it in my google bookmarks to visit then. Hey there. I found your web site via Google even as searching for a related matter, your web site got here up. It appears great. I have bookmarked it in my google bookmarks to visit then. Hi there. I found your blog via Google whilst searching for a related matter, your web site came up. It seems to be great. I have bookmarked it in my google bookmarks to visit then. Hey there. I found your blog by way of Google at the same time as looking for a related subject, your site came up. It appears to be good. I have bookmarked it in my google bookmarks to visit then. I would like to show thanks to the writer just for bailing me out of this particular circumstance. Because of checking through the internet and meeting notions which were not productive, I thought my life was done. Being alive devoid of the strategies to the issues you’ve solved as a result of your good guide is a serious case, and ones that could have adversely affected my career if I hadn’t encountered your blog post. Your own natural talent and kindness in dealing with a lot of things was very useful. I don’t know what I would’ve done if I had not come across such a subject like this. It’s possible to at this point look ahead to my future. Thanks a lot very much for this expert and results-oriented guide. I will not be reluctant to recommend your web site to anybody who wants and needs guide about this subject. Hiya, I’m really glad I have found this info. Nowadays bloggers publish only about gossip and internet stuff and this is actually frustrating. A good site with interesting content, this is what I need. Thank you for making this web site, and I’ll be visiting again. Do you do newsletters by email? Hiya, I’m really glad I have found this information. Today bloggers publish only about gossip and net stuff and this is actually irritating. A good site with exciting content, this is what I need. Thank you for making this site, and I will be visiting again. Do you do newsletters by email? Hello there. I found your site via Google even as searching for a comparable matter, your website came up. It appears to be great. I’ve bookmarked it in my google bookmarks to visit then. Hiya, I’m really glad I’ve found this information. Nowadays bloggers publish just about gossip and web stuff and this is actually irritating. A good site with exciting content, that is what I need. Thank you for making this web site, and I will be visiting again. Do you do newsletters by email? Hello there. I found your web site by means of Google even as looking for a related matter, your web site came up. It seems to be great. I have bookmarked it in my google bookmarks to visit then. Hey there. I found your website by way of Google even as searching for a similar topic, your web site got here up. It seems great. I’ve bookmarked it in my google bookmarks to visit then. Hello there. I found your web site via Google at the same time as looking for a related subject, your web site came up. It appears good. I’ve bookmarked it in my google bookmarks to come back then. Hi there. I discovered your website by means of Google whilst searching for a similar matter, your website got here up. It appears great. I’ve bookmarked it in my google bookmarks to come back then. Hiya, I am really glad I’ve found this info. Today bloggers publish just about gossip and net stuff and this is really irritating. A good web site with exciting content, this is what I need. Thanks for making this web site, and I’ll be visiting again. Do you do newsletters by email? Hey there. I discovered your site by means of Google at the same time as searching for a comparable matter, your site got here up. It appears great. I have bookmarked it in my google bookmarks to come back then. Hiya, I’m really glad I have found this info. Nowadays bloggers publish only about gossip and web stuff and this is actually annoying. A good web site with exciting content, that is what I need. Thanks for making this web-site, and I’ll be visiting again. Do you do newsletters by email? Hello there. I discovered your site by the use of Google at the same time as searching for a comparable topic, your web site got here up. It seems to be great. I have bookmarked it in my google bookmarks to come back then. Hiya, I am really glad I have found this information. Nowadays bloggers publish only about gossip and net stuff and this is actually annoying. A good site with interesting content, this is what I need. Thanks for making this website, and I will be visiting again. Do you do newsletters by email? Hiya, I am really glad I have found this info. Nowadays bloggers publish only about gossip and net stuff and this is really annoying. A good site with interesting content, this is what I need. Thanks for making this web-site, and I will be visiting again. Do you do newsletters by email? Hey there. I found your blog by means of Google while looking for a comparable subject, your website got here up. It seems great. I have bookmarked it in my google bookmarks to come back then. Hiya, I’m really glad I’ve found this info. Nowadays bloggers publish only about gossip and web stuff and this is actually annoying. A good blog with exciting content, that’s what I need. Thank you for making this web site, and I’ll be visiting again. Do you do newsletters by email? Hello there. I found your site by means of Google even as looking for a similar subject, your website got here up. It appears great. I have bookmarked it in my google bookmarks to come back then. Hiya, I am really glad I have found this information. Today bloggers publish only about gossip and internet stuff and this is really frustrating. A good blog with exciting content, this is what I need. Thanks for making this website, and I’ll be visiting again. Do you do newsletters by email? Hello there. I found your site via Google even as looking for a similar matter, your site came up. It seems great. I have bookmarked it in my google bookmarks to visit then. Hello there. I discovered your web site via Google while looking for a similar subject, your site came up. It appears to be good. I’ve bookmarked it in my google bookmarks to come back then. Between me and my husband we’ve owned more MP3 players over the years than I could count, including Sansas, iRivers, iPods (classic & touch), the Ibiza Rhapsody, etc. But, the previous few years I’ve settled down to one line of players. Why? Because I was happy to find how well-designed and fun to utilize the underappreciated (and widely mocked) Zunes are. Hey there. I found your web site via Google while looking for a comparable matter, your web site got here up. It seems to be great. I have bookmarked it in my google bookmarks to come back then. Hi there. I discovered your site by way of Google even as looking for a comparable matter, your web site came up. It seems to be great. I’ve bookmarked it in my google bookmarks to come back then. Hi there. I found your blog by way of Google whilst looking for a comparable topic, your website got here up. It seems to be great. I have bookmarked it in my google bookmarks to visit then. whoah this blog is excellent i really like reading your posts. Stay up the great paintings! You know, a lot of people are looking round for this info, you can aid them greatly. Hey there. I found your web site by means of Google whilst looking for a similar topic, your site came up. It seems to be great. I have bookmarked it in my google bookmarks to come back then. Hey there. I found your website by means of Google whilst looking for a comparable matter, your website got here up. It seems to be good. I’ve bookmarked it in my google bookmarks to visit then. Howdy very cool blog!! Man .. Beautiful .. Superb .. I will bookmark your blog and take the feeds also¡KI am glad to seek out so many useful info right here in the publish, we want work out extra techniques on this regard, thank you for sharing. . . . . .
Hello there. I found your blog by means of Google at the same time as searching for a similar topic, your website got here up. It seems good. I’ve bookmarked it in my google bookmarks to come back then. Hey there. I discovered your site by way of Google while looking for a similar matter, your website got here up. It looks good. I have bookmarked it in my google bookmarks to come back then. Hey there. I found your blog by way of Google even as searching for a similar subject, your web site got here up. It seems great. I’ve bookmarked it in my google bookmarks to visit then. Hiya, I’m really glad I’ve found this information. Today bloggers publish just about gossip and net stuff and this is actually irritating. A good web site with interesting content, that is what I need. Thank you for making this site, and I’ll be visiting again. Do you do newsletters by email? Hey there. I discovered your website via Google at the same time as searching for a comparable matter, your site got here up. It seems to be good. I have bookmarked it in my google bookmarks to come back then. Hiya, I’m really glad I’ve found this information. Today bloggers publish just about gossip and net stuff and this is actually irritating. A good web site with exciting content, this is what I need. Thanks for making this web site, and I will be visiting again. Do you do newsletters by email? Hiya, I am really glad I’ve found this information. Today bloggers publish only about gossip and net stuff and this is actually frustrating. A good web site with exciting content, this is what I need. Thank you for making this web-site, and I’ll be visiting again. Do you do newsletters by email? Hey there. I found your web site by means of Google even as searching for a comparable matter, your website came up. It looks good. I’ve bookmarked it in my google bookmarks to visit then. Hey there. I found your website by way of Google even as looking for a comparable topic, your website got here up. It seems to be great. I’ve bookmarked it in my google bookmarks to come back then. Hello there. I discovered your blog via Google whilst searching for a related topic, your site came up. It seems good. I’ve bookmarked it in my google bookmarks to come back then. Hello there. I found your website via Google at the same time as looking for a related subject, your web site came up. It seems to be good. I have bookmarked it in my google bookmarks to visit then. Hello there. I found your blog by the use of Google while looking for a related topic, your website came up. It appears good. I have bookmarked it in my google bookmarks to come back then. Hi there. I found your website by the use of Google whilst searching for a similar matter, your site got here up. It looks good. I’ve bookmarked it in my google bookmarks to come back then. Hiya, I’m really glad I’ve found this info. Nowadays bloggers publish just about gossip and web stuff and this is actually annoying. A good web site with exciting content, this is what I need. Thanks for making this web-site, and I’ll be visiting again. Do you do newsletters by email? Hiya, I am really glad I’ve found this info. Nowadays bloggers publish only about gossip and net stuff and this is actually irritating. A good website with exciting content, that is what I need. Thanks for making this site, and I will be visiting again. Do you do newsletters by email? Hiya, I’m really glad I have found this information. Nowadays bloggers publish only about gossip and web stuff and this is really irritating. A good website with interesting content, that is what I need. Thanks for making this web site, and I will be visiting again. Do you do newsletters by email? Hey there. I found your web site by the use of Google at the same time as searching for a related matter, your web site came up. It seems to be great. I have bookmarked it in my google bookmarks to come back then. Hey there. I discovered your blog by means of Google at the same time as searching for a comparable subject, your website came up. It looks good. I have bookmarked it in my google bookmarks to visit then. Hello there. I found your blog by means of Google while looking for a similar subject, your web site came up. It looks good. I’ve bookmarked it in my google bookmarks to visit then. Hiya, I’m really glad I have found this info. Today bloggers publish just about gossip and internet stuff and this is really annoying. A good web site with interesting content, that’s what I need. Thank you for making this site, and I will be visiting again. Do you do newsletters by email? Hiya, I’m really glad I’ve found this info. Nowadays bloggers publish only about gossip and internet stuff and this is really annoying. A good web site with interesting content, that’s what I need. Thank you for making this site, and I’ll be visiting again. Do you do newsletters by email? Hi there. I found your website by way of Google at the same time as looking for a similar topic, your web site got here up. It appears to be great. I have bookmarked it in my google bookmarks to come back then. Hello there. I found your website via Google even as looking for a related subject, your site came up. It looks good. I have bookmarked it in my google bookmarks to visit then. Hey there. I found your site via Google even as looking for a comparable matter, your website got here up. It seems to be good. I’ve bookmarked it in my google bookmarks to come back then. Hiya, I am really glad I have found this info. Today bloggers publish just about gossip and internet stuff and this is really annoying. A good website with interesting content, that is what I need. Thank you for making this web-site, and I’ll be visiting again. Do you do newsletters by email? Hiya, I am really glad I have found this info. Nowadays bloggers publish only about gossip and internet stuff and this is really frustrating. A good website with exciting content, this is what I need. Thanks for making this website, and I will be visiting again. Do you do newsletters by email? Hiya, I’m really glad I have found this information. Nowadays bloggers publish only about gossip and net stuff and this is really frustrating. A good web site with interesting content, this is what I need. Thank you for making this web site, and I’ll be visiting again. Do you do newsletters by email? Hey there. I discovered your web site by the use of Google at the same time as looking for a similar topic, your website came up. It appears to be great. I’ve bookmarked it in my google bookmarks to come back then. Hey there. I discovered your web site by the use of Google even as searching for a related matter, your web site came up. It seems good. I have bookmarked it in my google bookmarks to come back then. Hiya, I am really glad I’ve found this information. Today bloggers publish only about gossip and internet stuff and this is actually irritating. A good website with interesting content, this is what I need. Thanks for making this web site, and I’ll be visiting again. Do you do newsletters by email? Hey there. I discovered your site by the use of Google whilst searching for a related topic, your site got here up. It seems to be good. I have bookmarked it in my google bookmarks to visit then. Hi there. I discovered your site by way of Google even as looking for a similar subject, your site got here up. It looks great. I have bookmarked it in my google bookmarks to come back then. Hey there. I found your web site by way of Google whilst searching for a similar matter, your web site came up. It seems great. I’ve bookmarked it in my google bookmarks to visit then. Hi there. I found your website by means of Google while looking for a related matter, your web site got here up. It seems good. I’ve bookmarked it in my google bookmarks to come back then. Hiya, I’m really glad I’ve found this info. Today bloggers publish only about gossip and internet stuff and this is actually annoying. A good blog with interesting content, that is what I need. Thanks for making this web-site, and I will be visiting again. Do you do newsletters by email? Hello there. I found your blog via Google at the same time as searching for a comparable topic, your web site got here up. It seems to be good. I have bookmarked it in my google bookmarks to visit then. Hiya, I’m really glad I’ve found this information. Today bloggers publish just about gossip and web stuff and this is actually irritating. A good website with exciting content, that’s what I need. Thanks for making this web-site, and I’ll be visiting again. Do you do newsletters by email? Hey there. I found your website via Google while searching for a similar matter, your website got here up. It appears to be good. I’ve bookmarked it in my google bookmarks to visit then. What websites and also blogs do the surfing neighborhood interact most on? Hey there. I discovered your site by means of Google while searching for a comparable subject, your web site came up. It looks good. I have bookmarked it in my google bookmarks to visit then. Hey there. I found your site by way of Google even as looking for a similar matter, your website came up. It appears great. I’ve bookmarked it in my google bookmarks to come back then. Hiya, I’m really glad I’ve found this info. Today bloggers publish only about gossip and internet stuff and this is really annoying. A good website with exciting content, this is what I need. Thanks for making this site, and I’ll be visiting again. Do you do newsletters by email? Hey there. I found your blog via Google while looking for a comparable matter, your website got here up. It appears to be great. I have bookmarked it in my google bookmarks to come back then. Hi there. I discovered your site by the use of Google even as searching for a related matter, your site got here up. It looks great. I’ve bookmarked it in my google bookmarks to visit then. Hello there. I discovered your blog by way of Google at the same time as searching for a comparable topic, your site came up. It seems good. I’ve bookmarked it in my google bookmarks to come back then. Hiya, I am really glad I have found this info. Today bloggers publish just about gossip and internet stuff and this is really frustrating. A good web site with interesting content, this is what I need. Thank you for making this web site, and I will be visiting again. Do you do newsletters by email? I have actually been a yahoo customers for some years currently. I am only starting to utilize the devices which they give, among which being blog posts. I have created a blog site and would like to know if my article are being seen by others. Otherwise then does anybody know how I obtain my posts read. Hey there. I discovered your web site by way of Google whilst searching for a related subject, your website came up. It seems great. I’ve bookmarked it in my google bookmarks to come back then. Hey there. I discovered your web site by the use of Google whilst searching for a similar topic, your web site got here up. It looks great. I have bookmarked it in my google bookmarks to visit then. Hey there. I found your blog by way of Google at the same time as looking for a similar subject, your site came up. It seems great. I’ve bookmarked it in my google bookmarks to come back then. Hiya, I am really glad I have found this info. Nowadays bloggers publish just about gossip and internet stuff and this is actually annoying. A good website with exciting content, this is what I need. Thanks for making this site, and I will be visiting again. Do you do newsletters by email? Wow, amazing blog layout! How long have you been blogging for? you made running a blog look easy. The total look of your site is excellent, as well as the content! Thank you a lot for giving everyone an extremely spectacular chance to discover important secrets from here. It really is very useful and packed with a lot of fun for me and my office friends to visit your site more than 3 times every week to read through the newest tips you have got. And of course, I am just at all times amazed considering the splendid opinions you serve. Certain two tips in this post are particularly the best we have all had. Hiya, I am really glad I’ve found this info. Today bloggers publish just about gossip and net stuff and this is really annoying. A good web site with interesting content, that’s what I need. Thank you for making this site, and I’ll be visiting again. Do you do newsletters by email? Hello there. I found your site via Google even as looking for a comparable subject, your web site came up. It looks great. I’ve bookmarked it in my google bookmarks to visit then. Hi there. I found your website by way of Google at the same time as searching for a similar subject, your website came up. It appears good. I have bookmarked it in my google bookmarks to visit then. Hiya, I’m really glad I’ve found this info. Today bloggers publish just about gossip and net stuff and this is actually frustrating. A good web site with exciting content, that is what I need. Thanks for making this web-site, and I will be visiting again. Do you do newsletters by email? Hiya, I am really glad I have found this info. Today bloggers publish only about gossip and web stuff and this is really irritating. A good web site with interesting content, this is what I need. Thanks for making this site, and I will be visiting again. Do you do newsletters by email? Hiya, I am really glad I have found this information. Today bloggers publish only about gossip and web stuff and this is actually irritating. A good website with interesting content, that is what I need. Thanks for making this site, and I’ll be visiting again. Do you do newsletters by email? Hiya, I am really glad I have found this information. Today bloggers publish only about gossip and web stuff and this is really irritating. A good blog with exciting content, that is what I need. Thank you for making this web-site, and I’ll be visiting again. Do you do newsletters by email? Hello there. I discovered your site by the use of Google whilst searching for a similar matter, your web site got here up. It appears good. I have bookmarked it in my google bookmarks to come back then. Hello there. I discovered your website by way of Google while searching for a similar topic, your site got here up. It appears to be great. I have bookmarked it in my google bookmarks to come back then. Hey there. I found your site via Google while searching for a related matter, your website got here up. It appears to be great. I’ve bookmarked it in my google bookmarks to come back then. Hi there. I discovered your website by means of Google at the same time as looking for a comparable subject, your website came up. It seems to be great. I’ve bookmarked it in my google bookmarks to visit then. Hiya, I am really glad I’ve found this info. Nowadays bloggers publish only about gossip and web stuff and this is actually annoying. A good website with interesting content, that’s what I need. Thank you for making this website, and I’ll be visiting again. Do you do newsletters by email? Hiya, I’m really glad I’ve found this info. Nowadays bloggers publish just about gossip and internet stuff and this is actually frustrating. A good website with exciting content, this is what I need. Thank you for making this web-site, and I will be visiting again. Do you do newsletters by email? Hello there. I found your blog by the use of Google even as searching for a related subject, your site came up. It appears good. I’ve bookmarked it in my google bookmarks to come back then. Hey there. I found your web site by means of Google while searching for a comparable topic, your web site came up. It looks great. I have bookmarked it in my google bookmarks to visit then. Hey there. I found your blog by the use of Google whilst searching for a similar topic, your web site came up. It seems good. I have bookmarked it in my google bookmarks to come back then.